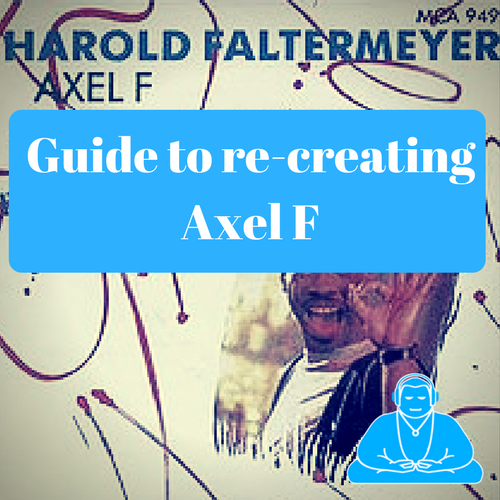 This is a guide to the recreation of Axel F using Logic 9 & Logic X. ‘Axel F’ by Harold Faltermeyer is the theme tune from the 1984 film Beverly Hills Cop. It topped the charts in 1985 and still remains a classic electronic instrumental track to this day. ‘Axel F’ uses some of the classic synths of the day. The synths used are the Roland Jupiter – 8, Moog Modular, DX7 and the Linn-drum. All of these sounds can be recreated in Logic 9 & X. Combined with the effects and processors available, it is possible to sequence a very accurate version of the song. I’ve tried to make this tutorial as straightforward as possible and avoid being too long-winded or technical. The tutorial shows how the Logic DAW can be used to create a solid sounding track, while while not drowning in technical jargon. This is a great way of really understanding the techniques and processes used in creating professionally produced music. It is then possible to use this knowledge on your own production and musical ideas. A high quality logic arrangement of ‘Axel F’ compatible with Logic 9 & Logic X. 40 minutes of video tutorials covering loads of sequencing tricks and production tips. A comprehensive PDF guide featuring how to recreate all the different sounds in detail. Notation of the main melody lines. The sequencing techniques implemented start simply and later progress through varying levels of difficulty. This song may appear simple at first, but when you start listening more closely it becomes apparent that there is plenty of depth for you to discover. This guide is to be used on conjunction with the tutorial videos. These videos will cover the various instruments, programming & mixing techniques that you can use. You can also use the provided score to help you, although it is more beneficial to use your ears to work out the different sections. Here is a snippet of one of the tutorial videos. All this is available for instant download when you purchase the guide. An arrangement of the Stranger Things Theme using just stock sounds from Logic Pro X 10.3.